Siemens offers a comprehensive range of process instruments for pressure, temperature, flow and level measurement. Pneumatic valve positioners, process controllers, process recorders and process protection devices complete the package. Whether you need a single instrument or a complete instrumentation package, Siemens is your professional supplier for any project. 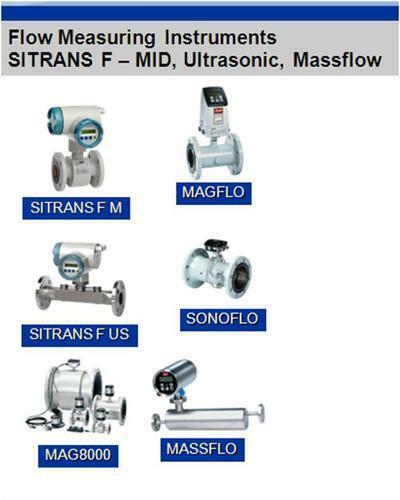 Counted as one of the renowned manufacturers, suppliers and traders, we are engaged in offering a high quality range of Flow transmitters. These devices are sturdily constructed using best available technologies and following international industrial standards. Our transmitters are extensively acclaimed for consistent performance and long functional life. Besides, these are offered in various technical specifications as per the exact requirements of clients. To meet the precise requirements of our clients, we manufacture, supply and trade a qualitative range of Temperature transmitters. These devices are engineered by our expert engineers, having rich industrial experience. Precisely engineered our devices are extensively acclaimed owing to application specific construction, dimensional accuracy and long functional performance. With the availability in various technical specifications, these devices are reasonably priced. SCADA - Supervisory Control and Data Acquisition is a system operating with coded signals over communication channels so as to provide control of remote equipment using typically one communication channel per remote stations. SITRANS P DS III pressure transmitters are digital pressuretransmitters featuring extensive user-friendliness and high accuracy.The parameterization is performed using control keys or viaHART, PROFIBUS-PA or FOUNDATION Fieldbus interface.Extensive functionality enables the pressure transmitter to beprecisely adapted to the plant’s requirements. Operation is verysimple in spite of the numerous setting options.Transmitters with type of protection "Intrinsic safety" and "Explosion-proof" may be installed within potentially explosive atmospheres(zone 1) or in zone 0. The transmitters are provided withan EC type examination certificate and comply with the correspondingharmonized European standards (ATEX).The transmitters can be equipped with various designs of remoteseals for special applications such as the measurement ofhighly viscous substances.